The Nautical Archaeology Program at Texas A&M University welcomes you to our website. Whether you found us simply by browsing, or are already familiar with the Nautical Archaeology Program, we hope that you will find this site informative and interesting. It contains information about available academic classes, as well as application procedures, and introduces you to the faculty and present and past students in the program. The site provides links to our various research projects and laboratories, and to the Institute of Nautical Archaeology, which is also located on the Texas A&M University campus in College Station. 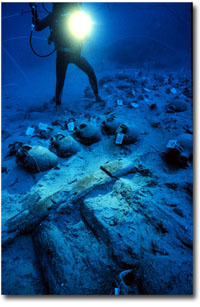 Nautical archaeology is the study of the remains of boats and ships and the cultures that created and used them. The program therefore focuses on the history of wooden ship construction; seafaring through the ages; maritime commerce, cargoes, and ports; and the techniques used to record, analyse and conserve the remains of these activities. Please check the faculty web pages for summaries of current research interests. The Nautical Archaeology Program is a part of the Department of Anthropology at Texas A&M University. The program was established in 1976. Students and faculty conduct underwater archaeological research in conjunction with the Institute of Nautical Archaeology in various regions of the world, delving into time periods from prehistory to the recent past, and working with a plethora of societies and cultures. Students attending the program work in the classroom as well as in the field, and are encouraged to pursue individual projects that will help direct nautical archaeology's future.